So, the 5th wheel arrived. We had special ordered this unit out of Mississippi at Country Creek RV. We had spent a great deal of time looking at all of the different brands and we chose the Palamino Columbus 320RS. We special ordered the unit because we wanted certain items, and we could not find one that had everything we needed. We wanted a washer/dryer, double pane windows, 2 AC units, and many other special order items.. We picked the unit up on October 31st, yes, halloween day. We arrived at Country Creek RV at around 2 pm, and after all of the paperwork, and walk through we left the dealership at about 6:15 pm. I had never pulled a 14,000 pound RV before, and it was dark outside when we left. Needless to say, I was a bit nervous about this. Luckily it was mostly 4 lane roads for the trip home, and we made it safely back at about 8 pm. We have been living in a vacation rental home at Dauphin Island for the past 3 months, and it was now time to close that chapter out. We had a great 3 months there! We did a lot of fishing, laying on the beach, watching beautiful sunsets, and ate some great food at the local restaurants. Reality of our next chapter was setting in. 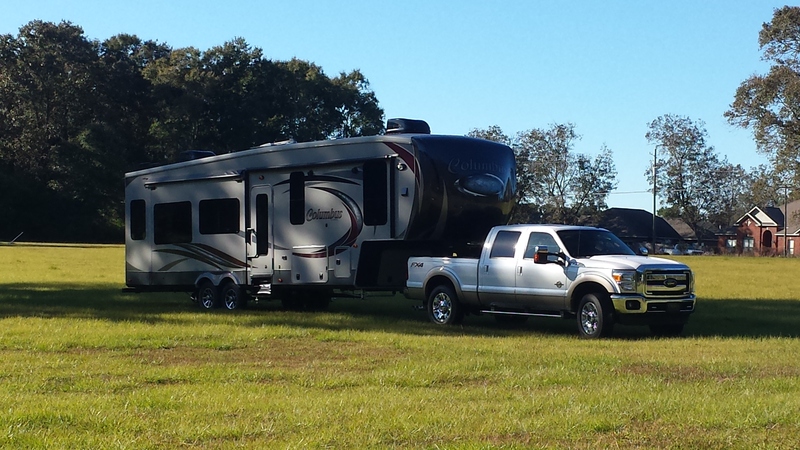 On November 9, 2014, we moved from the rental vacation home into our new 5th wheel RV. The first stop is Meaher Park on Mobile bay. The RV is only about 30 ft from the water’s edge, and it is speckled trout season in the Delta. We have been here for 3 days and we are still settling in and learning how to adapt to the new life style. So far it has been great fun. Our English bulldog “Lincoln” loves the new scenery, and we can’t wait to put the boat in the water and catch some fish. We have taken a few days off of work to get settled in so it should be interesting getting into the routine of going to work from here. I am unsure how long we will stay at Meaher park, but the plan is to stay until it gets uneventful, and then move on to the next spot. So far so good. Did our first load of laundry in the RV tonight and it worked great. We cooked a great meal tonight, and everything is going as planned. We have a powered antenna on the RV so we get about 25 free channels, and that means no cable bill. The park comes with wifi so that takes care of internet, and power and water are included in the small fee it costs to stay here. Cheap living, and better living in my book. Can’t wait to experience more of this park in the coming weeks. Next Post: See you later, Dauphin Island!